Lasagna noodles made from scratch in a Roma by Weston Traditional Pasta Machine, pasta sauce from garden ripe tomatoes strained in the Roma Tomato Strainer, and fresh ground elk meat from our COO's latest hunt make for an exceptionally delicious lasagna. Use a Roma Tomato Strainer with the Tomato/Apple Screen attached to puree your fresh tomatoes. combine all ingredients for the sauce in a large saucepan. Bring to a boil, stirring constantly, then turn the heat down to low to simmer the sauce. Be sure to give it a stir occasionally. Simmer over low heat for at least 2 hours, but up to 6. Mix Semolina and eggs in a mixing bowl until the dough begins to come together. Remove the dough, placing it on a cutting board, and being kneading it until the dough feels smooth and elastic. If the dough feels too dry, add a little water; too wet, add a little flour. Wrap the dough in plastic wrap and allow to rest for 20 minutes. After 20 minutes, remove the dough from the plastic wrap, then begin feeding a palm sized chunk of dough into the Pasta Machine on the thickest setting. Feed it through a couple times, trying to get the dough as square as possible (You can use a pasta bike to trim the edges to make a perfectly shaped sheet of dough, although it is not necessary). Feed the dough back through the machine, lowering the setting each time until you reach setting two. 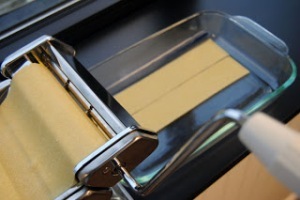 Move the handle from the pasta machine to the lasagna cutting attachment, then begin to feed the pasta sheet through the cutter. Repeat these steps for the rest of your dough - you should end up with around 20 lasagna noodles. One of the benefits of making your own lasagna noodles is that you may cut them to whatever size works for you. Lay the lasagna noodles flat onto wax or parchment paper and allow to dry while you prepare the rest. 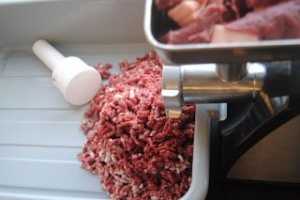 Cube the elk and fatback, then grind it through a Weston Meat Grinder with a coarse grinding plate intact. Thoroughly mix in the remaining ingredients for the filling, except the olive oil. Use the olive oil to thoroughly coat a medium saucepan, then heat the filling over medium heat until the meat is browned. While the meat is browning, it's a good idea to get a pot of water boiling for the lasagna noodles. Sprinkle a couple of pinches of salt into the water. Once boiling, drop the dried lasagna noodles into the water and allow to boil until soft - about 3 minutes. Spread a layer of pasta sauce over the bottom of your baking dish, then arrange three noodles across the dish. Mix together the ricotta, basil, and oregano, then spread a layer of it over the noodles. Spread a layer of ground elk over that, then cover with pasta sauce. Cover that with another layer of lasagna noodles, and repeat. Cover that final layer with lasagna noodles - in a basket weave if you like - cover those noodles with sauce, then sprinkle with mozzarella and parmesan, and finally, garlic powder. Place the lasagna in the oven for 40 minutes, covered. Serve while still hot and gooey.